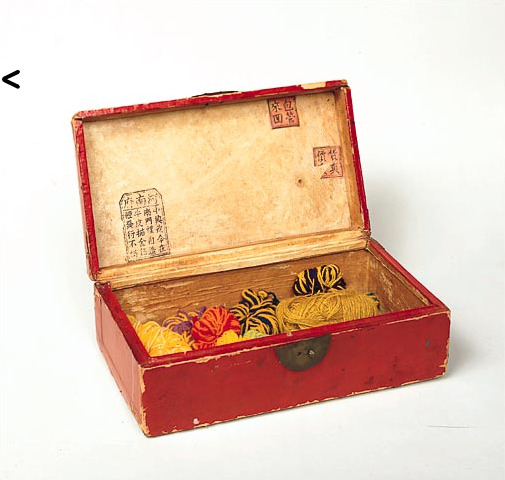 While I was reading Van Gogh and Gauguin by Debora Silverman, she mentions Van Gogh's yarn box. I was intrigued and hadn't remembered encountering the subject before. There's a black and white photo here along with an interesting read relating the yarn box and its possible relationship to the then new ideas of kindergarten, teaching children and play. Color photo here. So, inspired by that object, I wanted to make some yarn to use in this Van Gogh/Weaving project. I wanted to include colors and textures that reminded me of Van Gogh - I don't yet know how I'll incorporate this yarn into the show project...below are two stages of the same yarn. Still thinking, but will post how I decide to incorporate into weaving. Considering his family background, do you think he had a bigger collection somewhere? And if from his family, the yearns might have been relatively flat, though, as you say, his paintings are not... Oh, fascinating world you're getting into! Thanks for your questions, Meg. The pix I have seen of the yarns do show them to be "simple" yarns. Extend the Summer - Get to Maine + Fiber College!